Contestants race in the second Minimal Regatta at The Bel-Mar Boat Landing, 1700 S. Duchess Lane, Sunday afternoon. 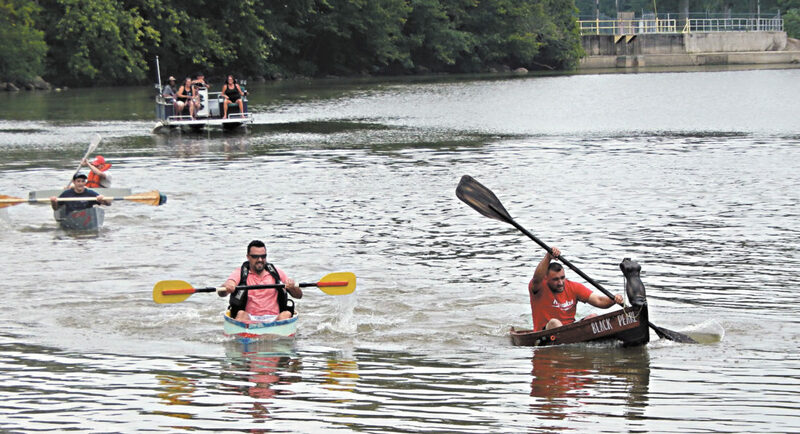 Teams were required to build a boat with limited supplies that was seaworthy enough for one person to navigate a short course in the Sandusky River, according to the event website. The benefit, sponsored by The Bel-Mar Boat Landing and The Tiffin Elks Club, was to raise money for Ruthie’s Angels and is to be earmarked to serve the residents of Seneca County, the website states. Ruthie’s Angels is a non-profit organization that assists those who have a life-altering medical diagnosis or terminal illness or individuals with a debilitating injury, according to the website. The organization offers to fund services to help with chronic pain, cancer treatments, injury rehabilitation and other ailments.